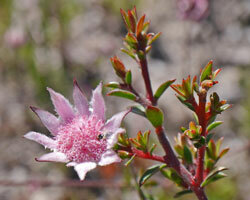 The Pink Flannel Flower (Actinotus forsythii) is a special plant. We in the Blue Mountains think of it as our own, but it also occurs south to Victoria. 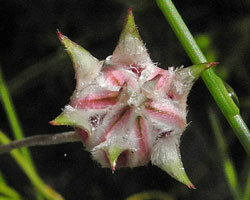 The generic name, Actinotus, means “bearing rays”, referring to the petal-like bracts surrounding each flowerhead. 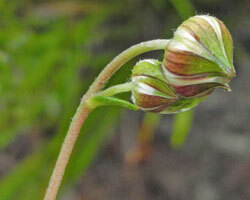 The species is named for William Forsyth, a plant collector who worked in the early 1900s. 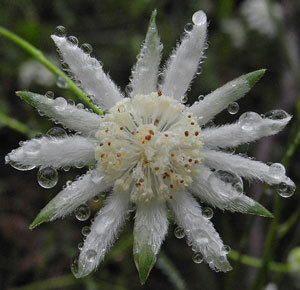 Although superficially the flower looks like a daisy, Actinotus is in the family Apiaceae. Carrot, parsley and celery also belong in this family, and among our local natives, Platysace is a well-known genus. This is a plant which only seems to appear and flower the summer after a fire. Years will go by without any reports. It is an annual and the seed can lie dormant for many years, but with the right conditions, fire and spring rain, it can produce a spectacular display. It likes to grow in shallow, skeletal soils on ridges. Aspect doesn’t seem to matter. I have seen flowers in full sun at Mt Hay and also on south facing cliffs along Prince Henry cliff walk. 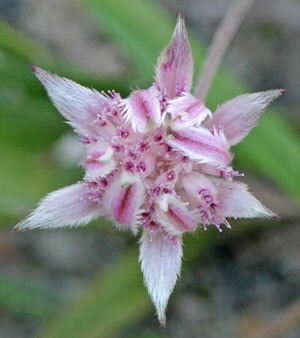 I have also found flowers in various places from Newnes Plateau to Katoomba, Wentworth Falls, and at Kanangra Walls. One of the most spectacular displays in recent years was on Newnes Plateau in 2015 after the State Mine fire in 2014. 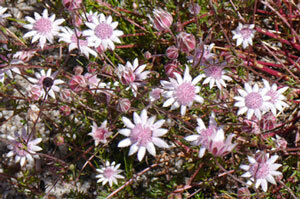 Pink Flannel Flowers seemed to be everywhere and most mountain plant “nuts” made several visits. The last sighting I had was in January 2017 on Kings Tableland below the tower. Who knows where or when they will be seen next? 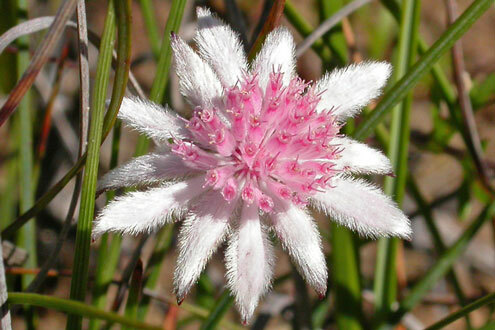 While most flowers are varying shades of pink, it is not unusual to find a white one. For anyone keen to find these beautiful plants I suggest checking on areas that have been burnt, particularly in the Upper Mountains near cliff edges. In these shallow soils over sandstone ledges there is often water seepage along the ledges and these seem to be the conditions favoured by Pink Flannel Flowers. In your excitement though, please keep away from the edge.